4 Quotations Chapter 38 "That was just his way. If it didn't suit him to explain a thing to you, he wouldn't do it. You might pump at him a week, and it wouldn't make no difference." 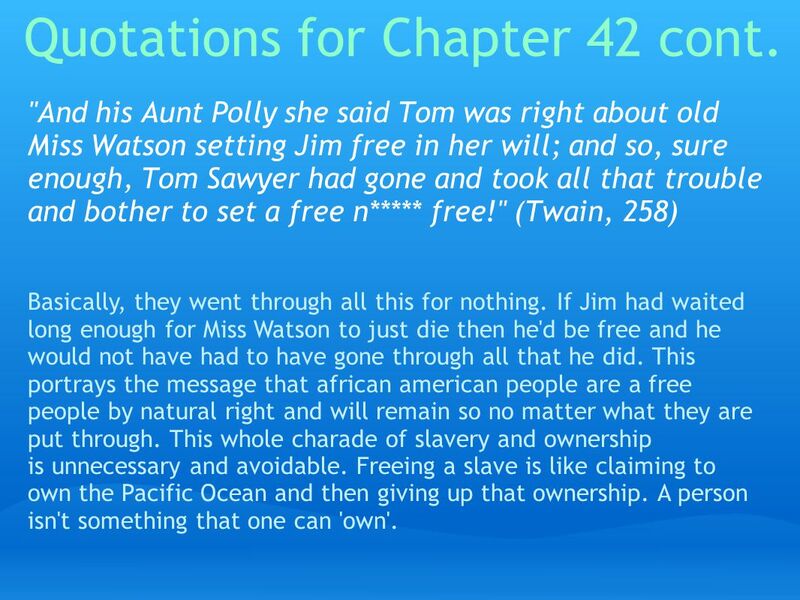 (Twain 231) Analysis: Here, Huck keeps trying to convince Tom to explain what he is talking about, when Tom is describing Jim's coat of arms. Huck doesn't understand Tom's elaborate language, however, it is clear that Tom does not even understand his own language, and he is not quite sure of what he is saying. Because Tom does not have a solid answer for Huck, he chooses not to say anyting at all on the matter. This shows how humans view not understanding something as a sign of weakness, and refuse to admit to it. "...Tom most lost all patience with him; and said he was just loadened down with more gaudier chances than a prisoner ever had in the world to make a name for himself, and yet he didn't know enough to appreciate them, and they was just about wasted on him. So Jim he was sorry, and said he wouldn't behave so no more, and then me and Tom shoved for bed." (Twain 235) Analysis: Tom truly feels that Jim is not smart enough to understand the escape plan, and that he has no appreciation for the plan at all. Tom also states that the "privileges" - so to speak - of a prisoner were being wasted on Jim, but yet there really are no advantages of being a prisoner in Jim's case. Tom belittles Jim, and makes him feel inferior to the point where Jim blames himself for not understanding. 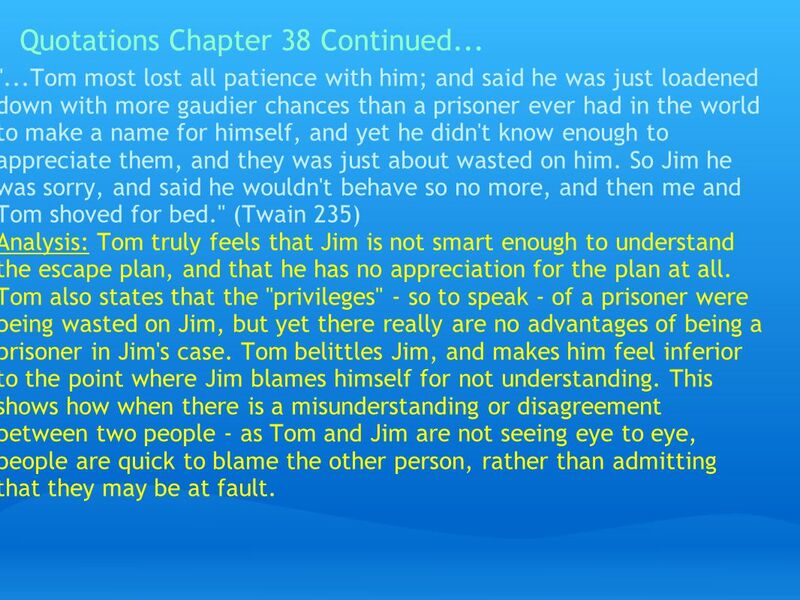 This shows how when there is a misunderstanding or disagreement between two people - as Tom and Jim are not seeing eye to eye, people are quick to blame the other person, rather than admitting that they may be at fault. 7 Quotations Chapter 39 "The old man had wrote a couple of times to the plantation below Orleans to come and get their runaway n****, but hadn't got no answer...so he allowed he would advertise Jim in the St. Louis and New Orleans papers; and when he mentioned the St. Louis ones it give me the cold shivers, and I see we hadn't no time to loose." (Twain 238) Analysis: Here Huck is mentioning Uncle Silas' efforts to send Jim back, and get him off the land. Huck shows that he is worried about word getting out regarding Jim, and jeopardizing his goal of freedom. 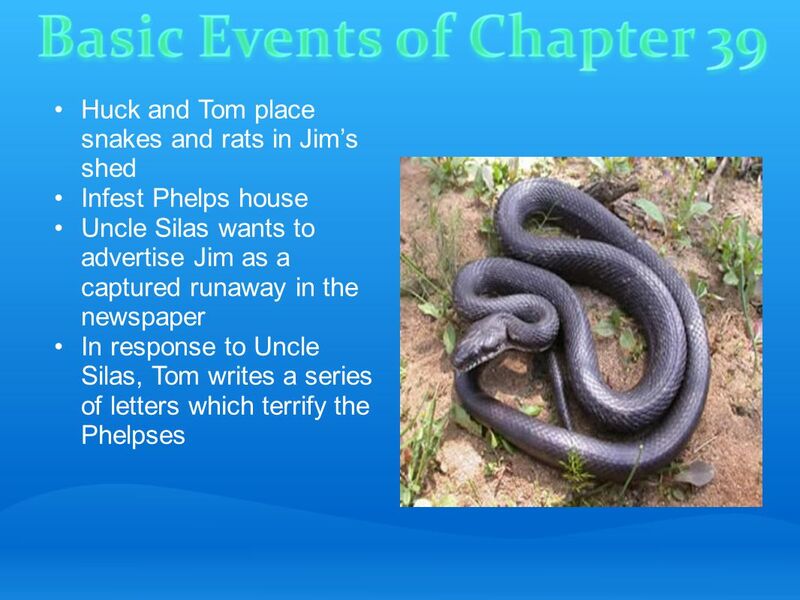 This shows that Huck genuinely wants to help Jim reach his goals, and get off of the Phelps' land and to safety, proving that Huck truly cares about Jim. "'Shucks!' he says, and looked disgusted. so I says: 'But I ain't going to make no complaint. Any way that suits you suits me.'" 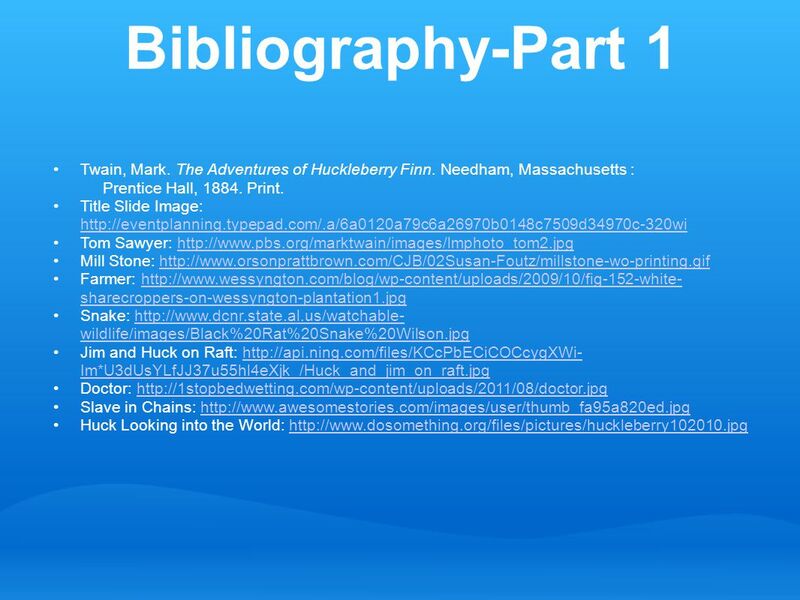 (Twain 238) Analysis: Huck is being extremely passive towards Tom, and he is going along with whatever Tom says, even if he might have his own ideas. 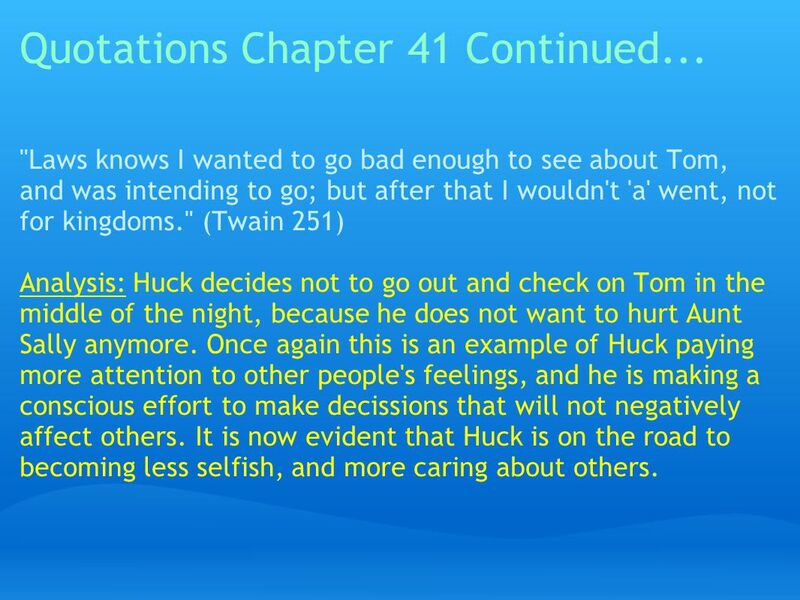 This shows that Huck is still incapable of standing up to Tom, even if that's the right thing to do. 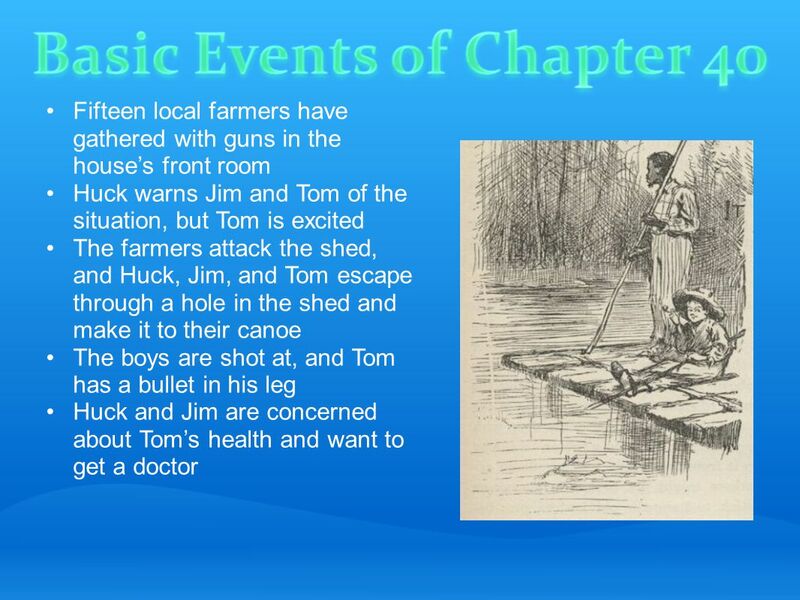 Huck looks up to Tom, and views him as a role model, thinking that everything Tom says and does is right, however, this could be hurting the both of them as well as Jim, as it is easy to see that often times Tom is VERY WRONG! 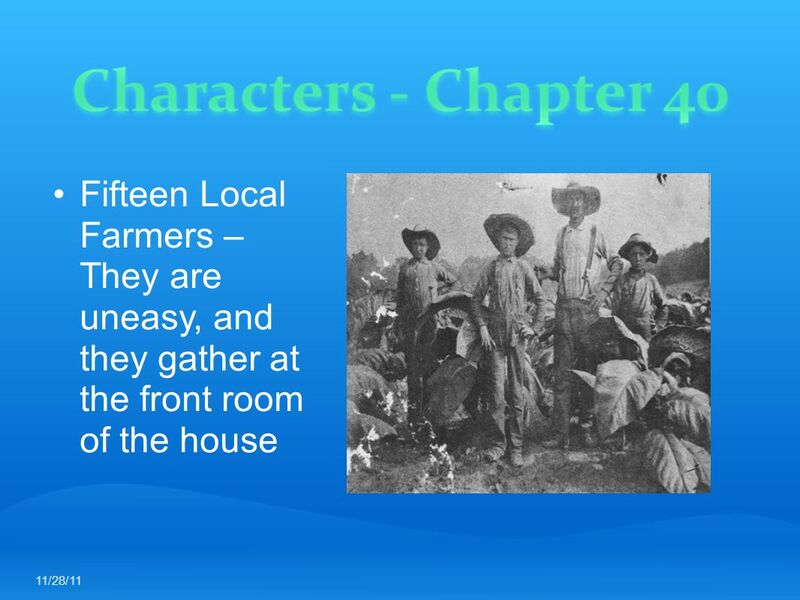 11 Quotations Chapter 40... "I knowed he was white inside, and I reckoned he'd say what he did say - so it was all right now, and I told Tom I was a-going for a doctor." 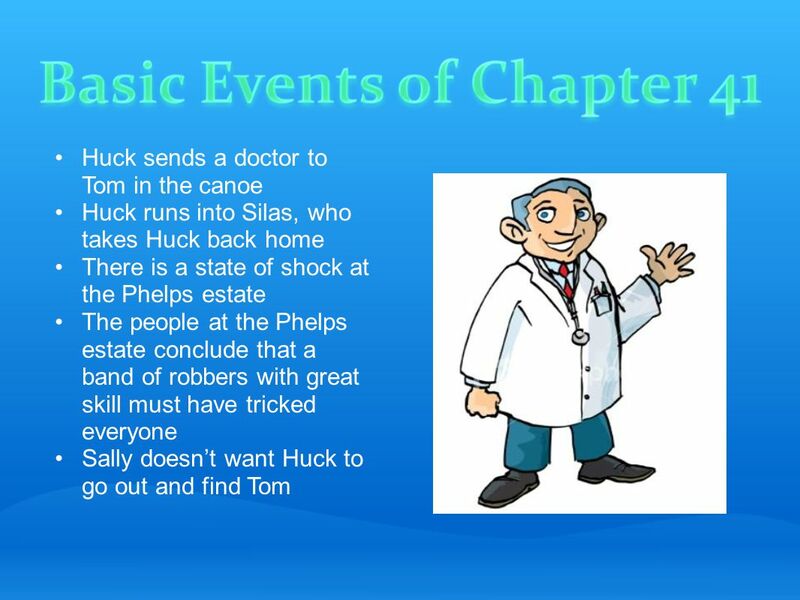 (Twain 245) Analysis: After Jim shares his logical thinking and reasoning with Huck and Tom regarding whether or not Tom needed a doctor, Huck assumes and concludes that Jim must be white at the core, proving that he believes that such wisdom could only come from a white person. 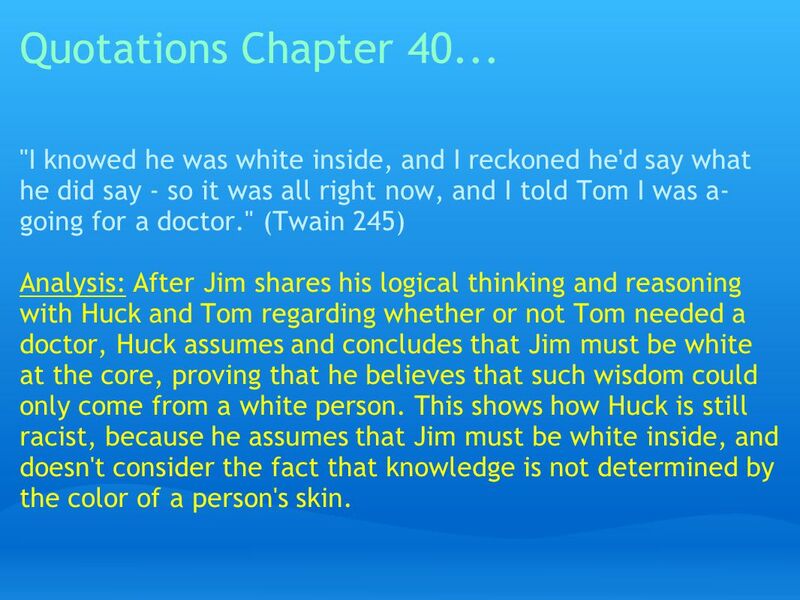 This shows how Huck is still racist, because he assumes that Jim must be white inside, and doesn't consider the fact that knowledge is not determined by the color of a person's skin. "'We can get along with it too' he says; 'just you slide down cellar and fetch it. And then mosey right down the lightning-rod and come along.'" 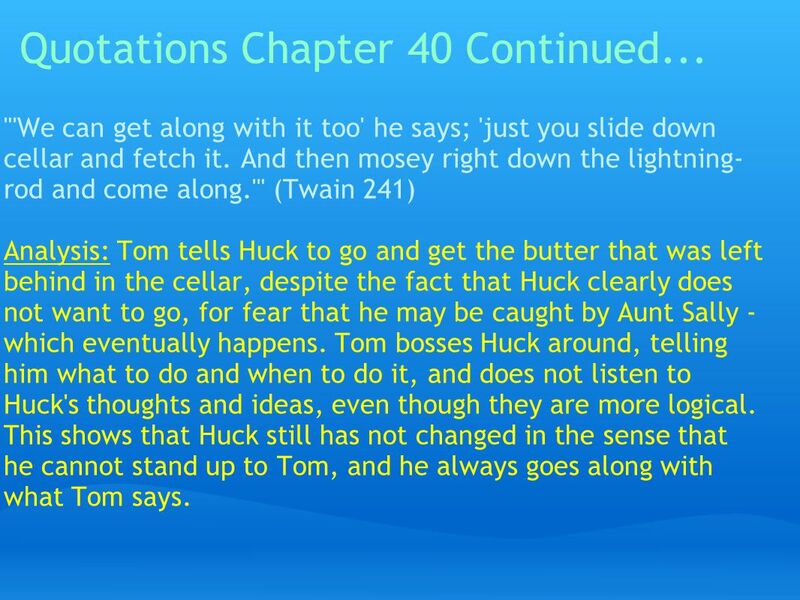 (Twain 241) Analysis: Tom tells Huck to go and get the butter that was left behind in the cellar, despite the fact that Huck clearly does not want to go, for fear that he may be caught by Aunt Sally - which eventually happens. 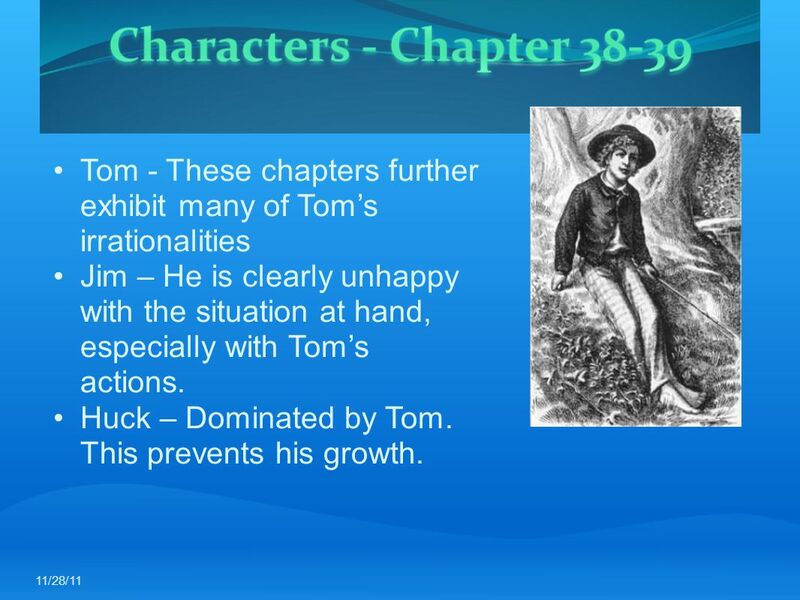 Tom bosses Huck around, telling him what to do and when to do it, and does not listen to Huck's thoughts and ideas, even though they are more logical. 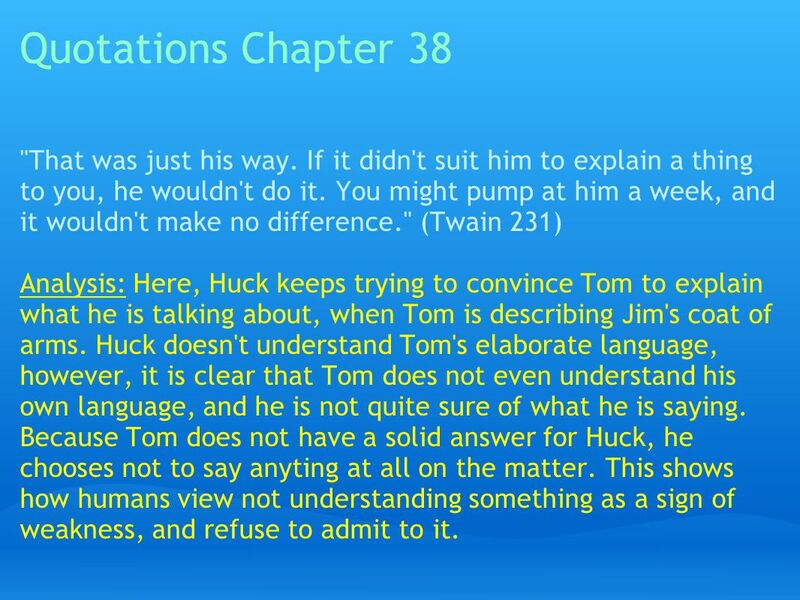 This shows that Huck still has not changed in the sense that he cannot stand up to Tom, and he always goes along with what Tom says. 15 Quotations Chapter 41 "And then when I went up to bed she come up with me and fetched her candle, and tucked me in, and mothered me so good I felt mean, and like I couldn't look her in the face." (Twain 251) Analysis: Here it is evident that Huck is feeling guilty for all the emotional pain he and Tom have caused Aunt Sally to feel. He recognizes her feelings, and is greatly affected by them. This shows that Huck has grown, and he is now able to relate and understand other people's emotions. Also, Huck is experiencing what it feels like to have a mother - someone who loves him and cares for him, and the fact that he is experiencing this is causing him to be more in-tune to other peoples's emotions. "Laws knows I wanted to go bad enough to see about Tom, and was intending to go; but after that I wouldn't 'a' went, not for kingdoms." 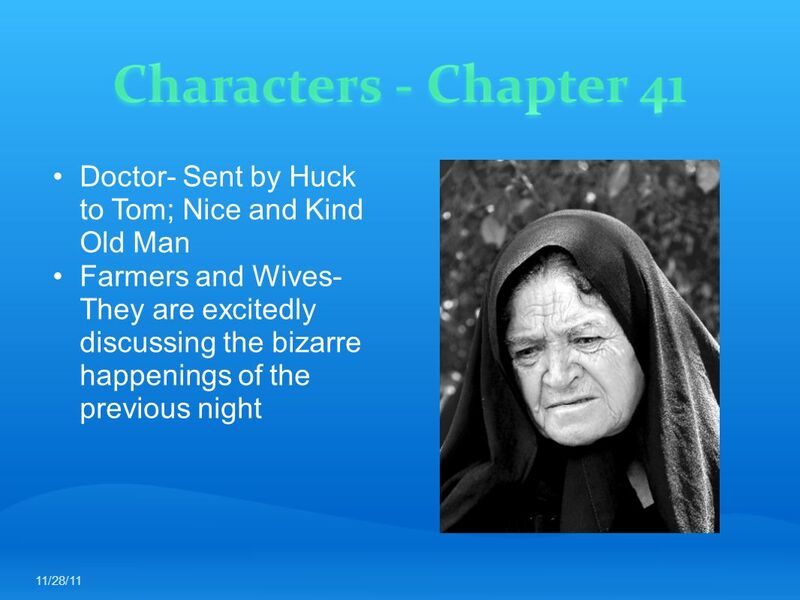 (Twain 251) Analysis: Huck decides not to go out and check on Tom in the middle of the night, because he does not want to hurt Aunt Sally anymore. Once again this is an example of Huck paying more attention to other people's feelings, and he is making a conscious effort to make decissions that will not negatively affect others. It is now evident that Huck is on the road to becoming less selfish, and more caring about others. 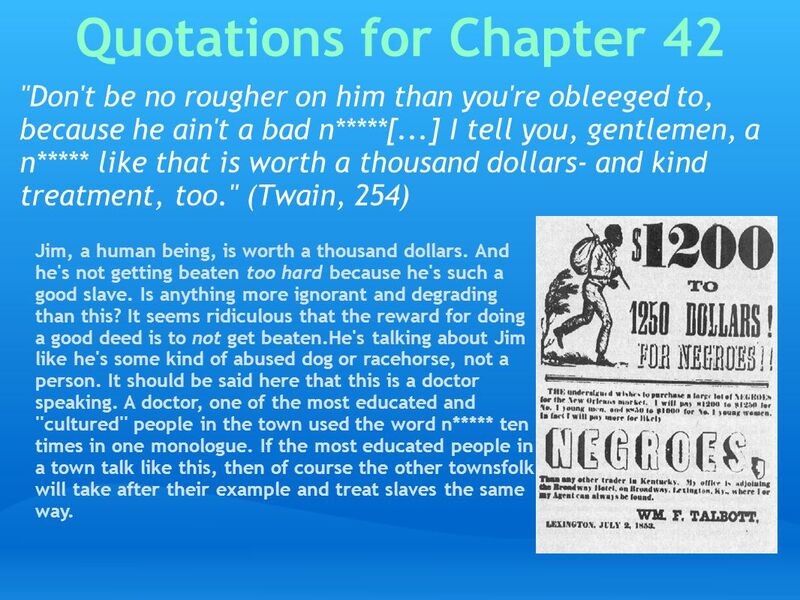 "Don't be no rougher on him than you're obleeged to, because he ain't a bad n*****[...] I tell you, gentlemen, a n***** like that is worth a thousand dollars- and kind treatment, too." (Twain, 254) Jim, a human being, is worth a thousand dollars. And he's not getting beaten too hard because he's such a good slave. Is anything more ignorant and degrading than this? It seems ridiculous that the reward for doing a good deed is to not get beaten.He's talking about Jim like he's some kind of abused dog or racehorse, not a person. It should be said here that this is a doctor speaking. A doctor, one of the most educated and ''cultured'' people in the town used the word n***** ten times in one monologue. If the most educated people in a town talk like this, then of course the other townsfolk will take after their example and treat slaves the same way. 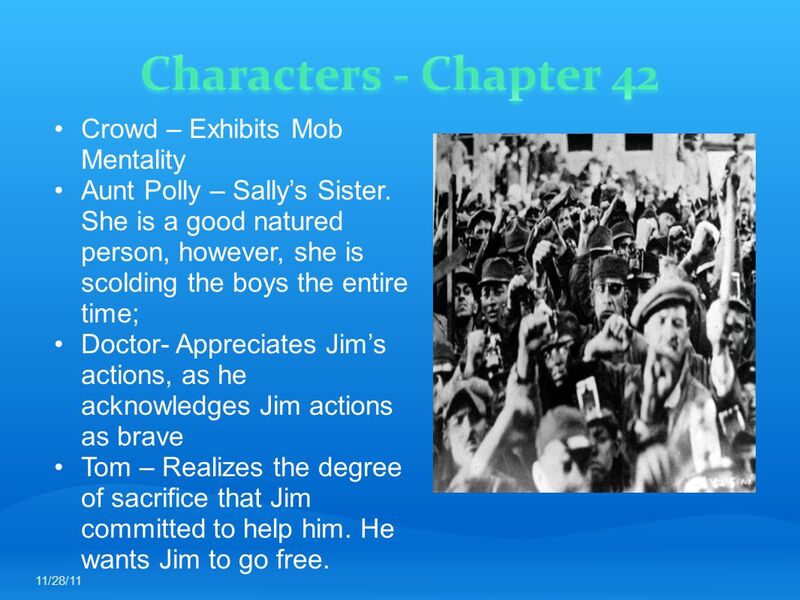 20 Quotations for Chapter 42 cont. 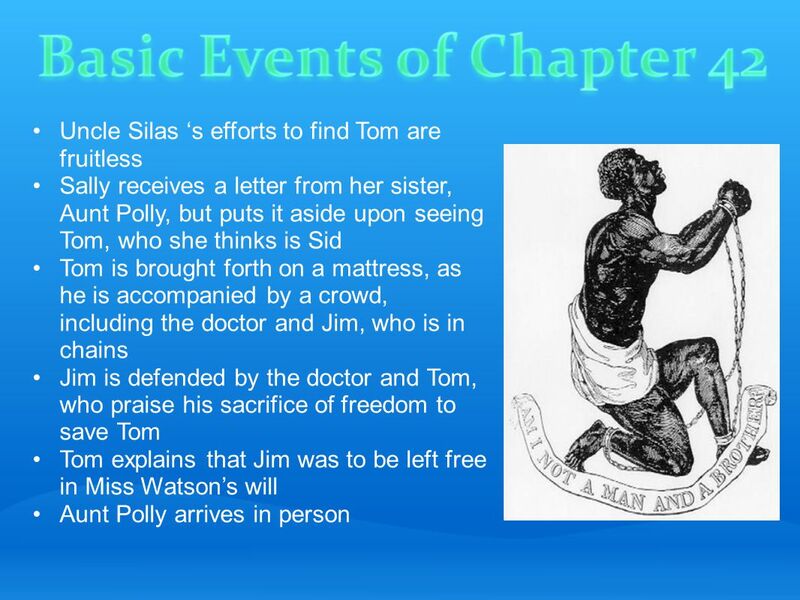 "And his Aunt Polly she said Tom was right about old Miss Watson setting Jim free in her will; and so, sure enough, Tom Sawyer had gone and took all that trouble and bother to set a free n***** free!" (Twain, 258) Basically, they went through all this for nothing. If Jim had waited long enough for Miss Watson to just die then he'd be free and he would not have had to have gone through all that he did. This portrays the message that african american people are a free people by natural right and will remain so no matter what they are put through. This whole charade of slavery and ownership is unnecessary and avoidable. Freeing a slave is like claiming to own the Pacific Ocean and then giving up that ownership. A person isn't something that one can 'own'. 21 Tom is appreciative of Jim’s actions, as he gives Jim money, thanks, etc. 22 Chapter 43 Quotations "Dah, now, Huck, what I tell you?- what I tell you up dah on Jackson Island? I tole you I got a hairy breas'- en what's de sign un it; en I tole you I ben rich wunst, en gwineter be rich ag'in; en it's come true; en heah she is! Dah, now! doan't talk to me- signs is signs, mine I tell you; en I knowed jis' 's well 'at I 'uz gwineter be rich ag'in as I's a-stannin' heah dis minute!" 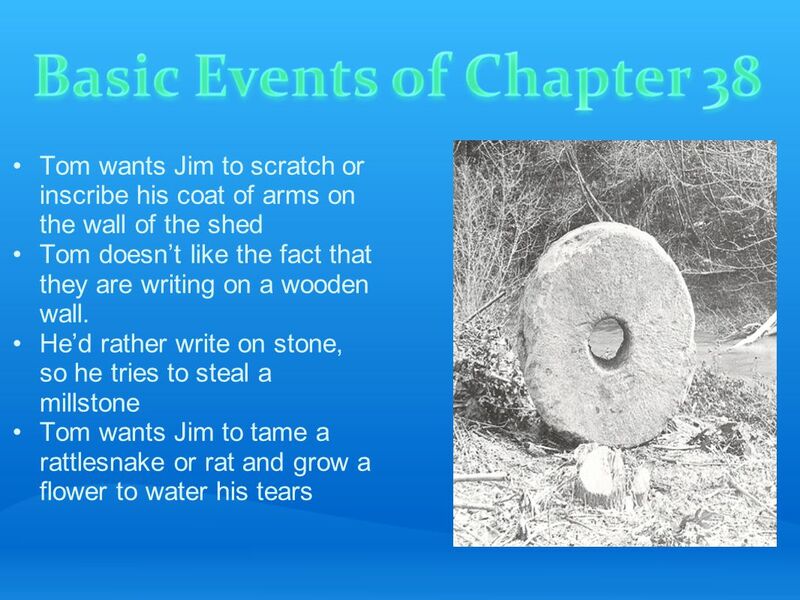 (Twain, 259) This really showcases Jim's superstitious ways. And this instance is only going to confirm his beliefs. Also, take note that Jim has not been this incoherent since the beginning of the novel. As the novel progressed, he seemed to be easier to understand and in this selection, he sounds just as he did at the beginning. This probably shows that Huck's racist ways are still prevalent. 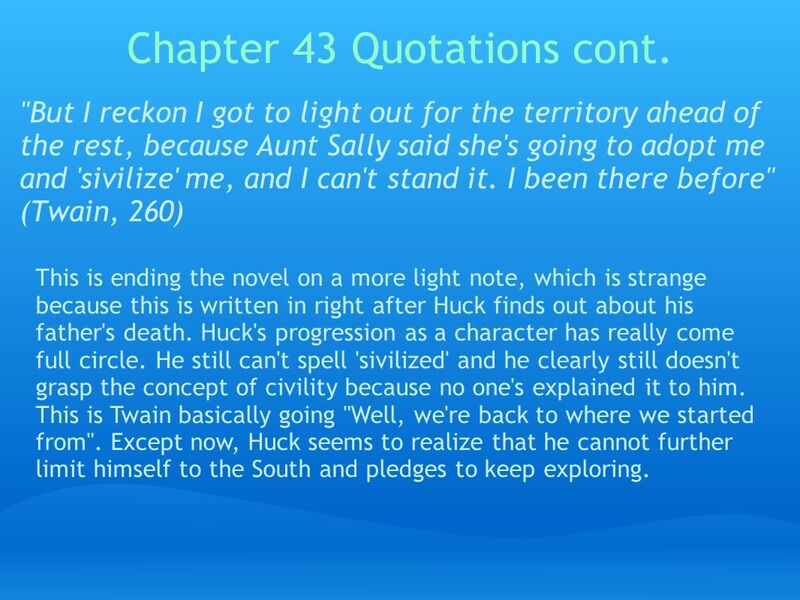 23 Chapter 43 Quotations cont. "But I reckon I got to light out for the territory ahead of the rest, because Aunt Sally said she's going to adopt me and 'sivilize' me, and I can't stand it. I been there before" (Twain, 260) This is ending the novel on a more light note, which is strange because this is written in right after Huck finds out about his father's death. Huck's progression as a character has really come full circle. He still can't spell 'sivilized' and he clearly still doesn't grasp the concept of civility because no one's explained it to him. This is Twain basically going "Well, we're back to where we started from". Except now, Huck seems to realize that he cannot further limit himself to the South and pledges to keep exploring. 24 Adolescents look towards powerful figures to fill the position of a 'role model'. The Doctor of the town that they're in is extremely racist. However, he is respected because of his power. 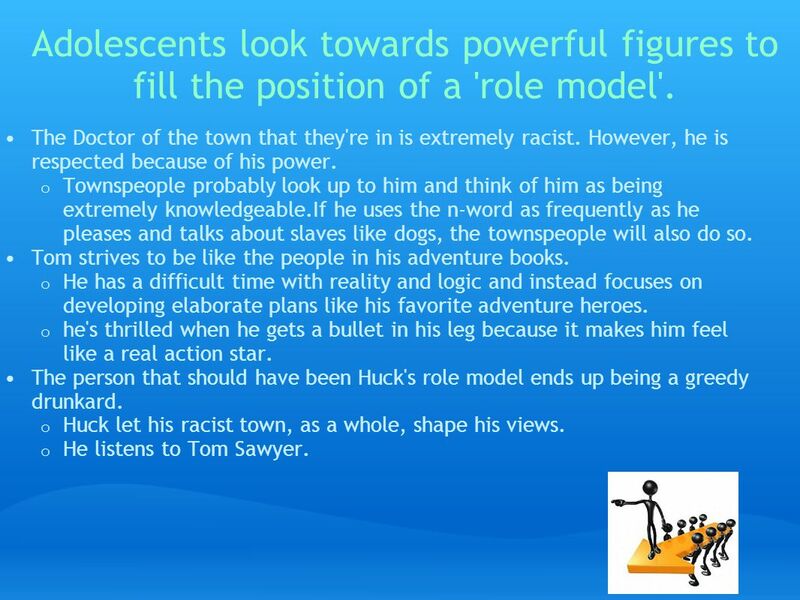 Townspeople probably look up to him and think of him as being extremely knowledgeable.If he uses the n-word as frequently as he pleases and talks about slaves like dogs, the townspeople will also do so. Tom strives to be like the people in his adventure books. He has a difficult time with reality and logic and instead focuses on developing elaborate plans like his favorite adventure heroes. he's thrilled when he gets a bullet in his leg because it makes him feel like a real action star. The person that should have been Huck's role model ends up being a greedy drunkard. Huck let his racist town, as a whole, shape his views. He listens to Tom Sawyer. 25 Learning is only achieved through questioning. While Huck goes along with what Tom Sawyer says, he knows on the inside that Tom has absolutely no idea what he's doing. He'd previously questioned and tested Tom's theories and disproved them and he now has the knowledge to dismiss Tom's theories as being foolish (although he's too intimidated to say so). Huck isn't inclined towards religion He posed many questions about Christianity to the Widow and to Miss Watson and never seemed to get satisfying answers. He grows to appreciate Jim's superstitions because they seem to have some kind of basis. Jim seems to be more patient and more willing to offer answers. 26 Society trains people into thinking that the worth of others can be measured in material possessions. The doctor estimates that Jim's price should be around $1000. This is dehumanizing. Jim is a person, people don't have prices. If someone had tried to sell a white man, people would raise all sorts of issues. People also start determining their own self-worth based on their possessions. Tom's thrilled with the bullet in his leg He probably sees it as a kind of heroic badge He gets to get a taste of what its like to be on a real adventure, like in his books. 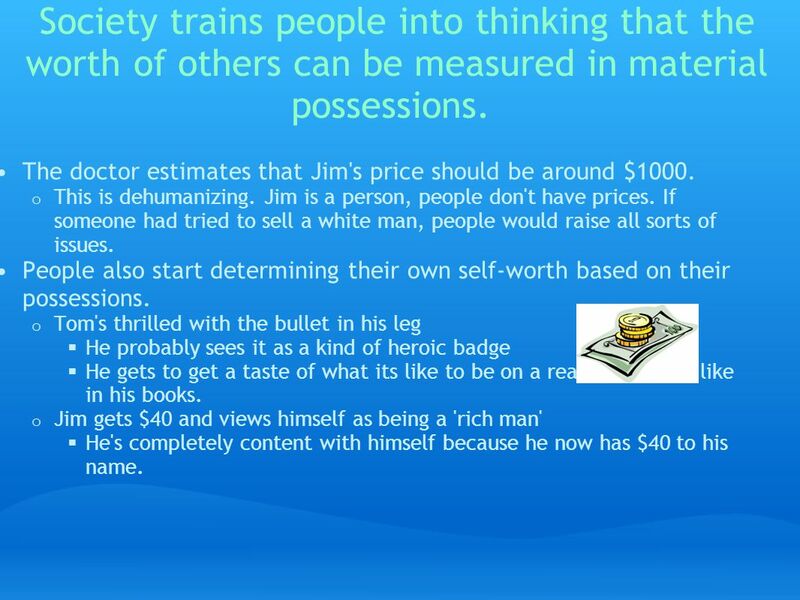 Jim gets $40 and views himself as being a 'rich man' He's completely content with himself because he now has $40 to his name. 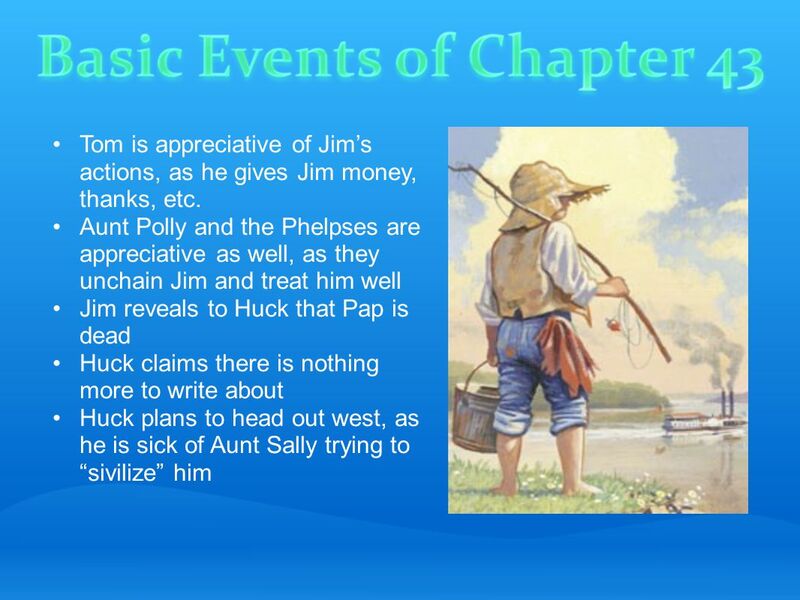 27 Throughout the novel, we've seen Huck grow and change because of his friendship with Jim. 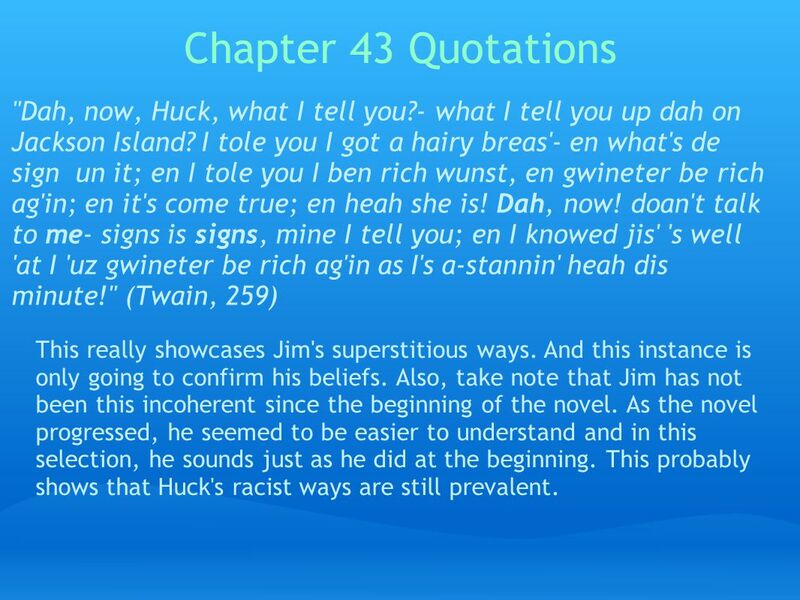 Although Huck regards him as a companion, he still refers to Jim and other black people as the n-word. 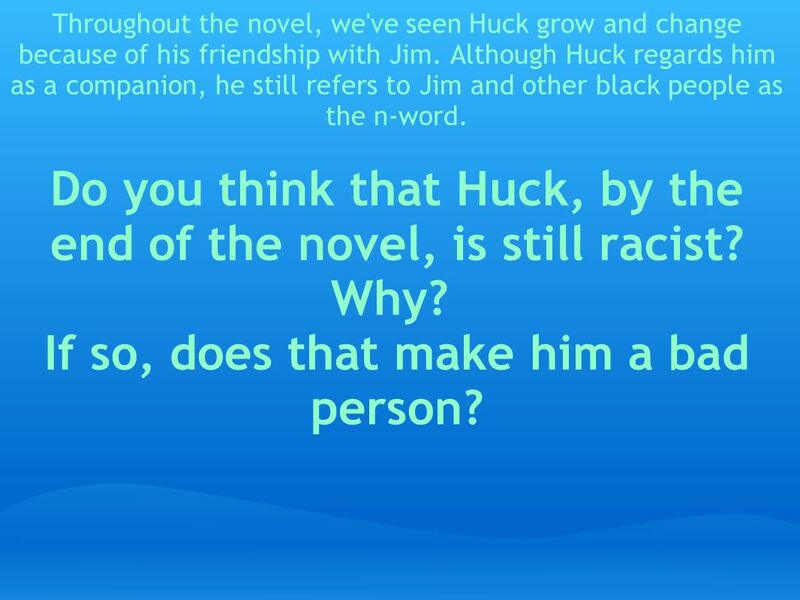 Do you think that Huck, by the end of the novel, is still racist? Why? If so, does that make him a bad person? 28 Miss Watson, Widow Douglas, and now Aunt Sally have all tried to 'sivilize' Huck. 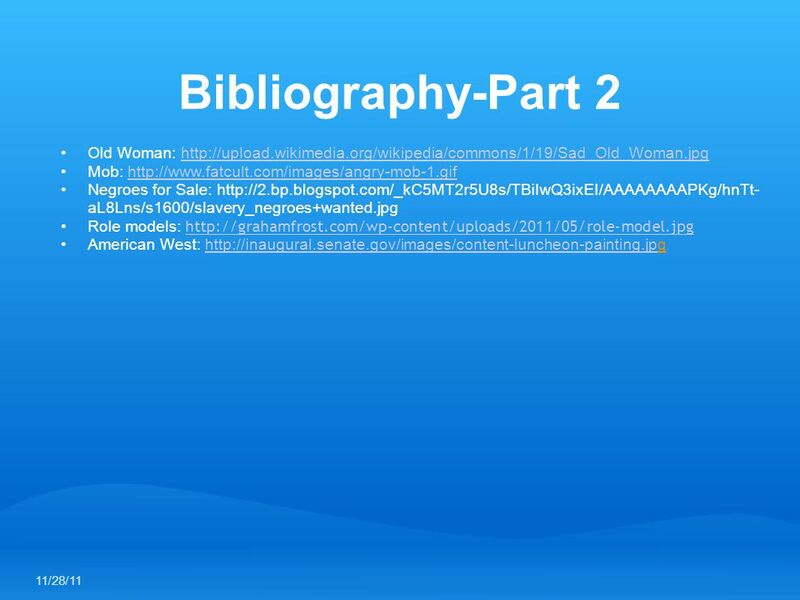 Miss Watson is a slave-owner, yet she still considers herself to be 'civilized'. 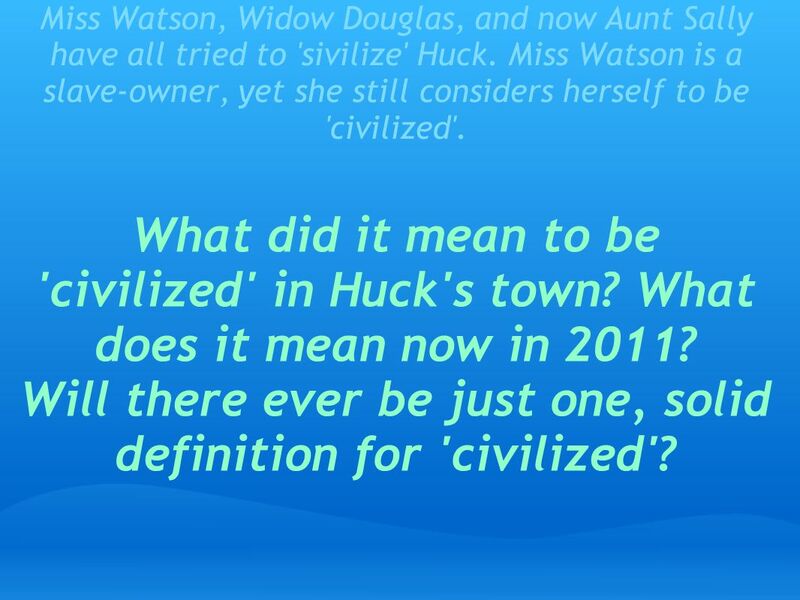 What did it mean to be 'civilized' in Huck's town? What does it mean now in 2011? Will there ever be just one, solid definition for 'civilized'? 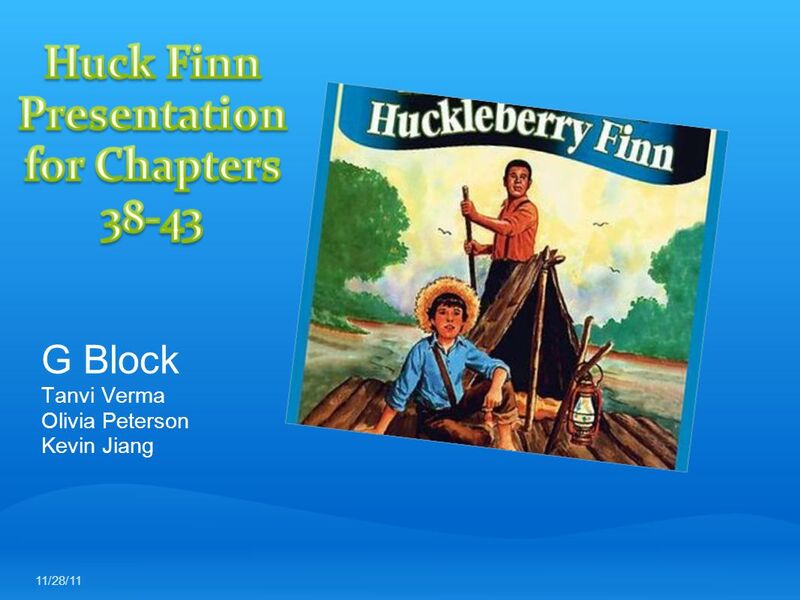 Download ppt "G Block Tanvi Verma Olivia Peterson Kevin Jiang"
The Adventures of Huck Finn Romantics vs. Realist. By Mark Twain Written in 1884 as a sequel to The Adventures of Tom Sawyer. Originally called Huck Finn’s Autobiography. A novel that has been given much. The Philosophy of Exotischism The Essence of the Soul 341 You may have heard it said that it is a good thing that we all feel shame from time to time. The Philosophy of Exotischism Listening To Your Heart 248 In a situation like the one above where a man with normal spiritual abilities finally decides. The Adventures of Huck Finn Review Game!